The Irish Open in Killarney looks set to be an even bigger success this year. Pic: www.golffile.ieKillarney’s Killeen Course will be a tougher prospect for Rory McIlroy and Co. this time around when it hosts “The Irish Open presented by Discover Ireland” from July 28-31. It’s bad news for the players ahead of an event that has seen its prize fund slashed in half - to just €1.5m - following the exodus of title sponsors “3” last year. But the good news is that European Tour and Failte Ireland will bear the €3m-plus prize money and staging costs and ride out the storm ahead of what they hope will be a new, three-year title sponsorship announcement next season. Whether it returns to Killarney for a third year remains to be seen but it will certainly be tough this year. England’s Ross Fisher flirted with a 59 and eventually shot a 10-under par 61 in the second round en route to an 18-under total and a two-shot win over Padraig Harrington last year. But Killarney’s general manager, Maurice O’Meara, believes the course will show more teeth this time around for an event that looks set to send the Kerry town into party mode for the August Bank holiday weekend. That’s 88 yards longer than last year and O’Meara is delighted that a recent spell of rain has made the rough far more penal. Last year’s event received massive publicity as “3” advertised heavily in the months preceding the tournament before finally deciding to pull the plug and invest their cash in Irish soccer. But while a European Tour official admitted that they are “behind the curve” on the ticket sales score having spent all year searching for a new sponsor (could UPS be ready to move? ), Rory McIlroy has saved the day with his US Open win. Killarney’s O’Meara said: “When Rory won the US Open it was like flicking on a switch. There’s a huge buzz in town about the Irish Open and we have the Killarney Summerfest running concurrently with the tournament. The fans are expected to turn out in their droves in Killarney to see McIlroy, but the big picture also looks sunnier in terms of efforts to build the event with the introduction of a new backer. With “3” pulling the sponsorship plug after just two years of its three year deal last year, the tournament prize fund has been slashed from €3 million to €1.5 million with the winner earning €250,000. Padraig Harrington prepares to play his second shot to the 18th in last year’s final round. Pic: Fran Caffrey/www.golffile.ie.The total cost of staging the event is expected to exceed €3m but the European Tour’s chief executive, George O’Grady is confident that the tour can break even thanks to €1.25m in funding from Failte Ireland, its subsidiary sponsors and some unnamed, Irish business figures who are preparing to take an even greater role in the tournament next year. The European Tour and Failte Ireland revealed that it came close to securing a new sponsorship deal this season but the lack of a generous lead-in time in terms of promotion prevented all parties from going ahead. Redmond O’Donoghue, the Chairman of Failte Ireland, said: “We would be hopeful that we will have a corporate sponsor for succeeding years. We can’t promise it, but I believe we will because it is an outstandingly good event. “I know it will answer the marketing objectives for some corporation and we will have a major title sponsor for the Irish Open before too long. The European Tour has insisted in the past that it is not a benevolent organisation and that no event has a God-given right to exist in the current commercial climate. Graeme McDowell tees off on the third in the final round at the Killarney Golf & Fishing Club last year. Pic: Eoin Clarke/www.golffile.ie)Its Chief Executive, George O’Grady, won’t bail out the Irish Open indefinitely but conceded at the press conference at Failte Ireland HQ today that with the tourism body insisting it will remain committed to event come hell or high water, he would also remain on board. O’Grady said: “The European Tour will remain committed to the Irish Open for as long as we possibly can and for as long as Ireland wants us. Confirming that the Irish Open will go ahead next year even if the proposed new title sponsor fails to materialise, O’Grady added: “With Failte Ireland saying we are definitely on for the future and if we don’t pull off some of our commercial objectives, we might stay around the same sort of [prize fund] level with some small increases. Keep an eye out for the list of participants in the Pro-Am this year if your wondering which Irish business figures are helping out behind the scenes. Could horse-racing giant and multi-millionaire businessman JP McManus be involved? It certainly appears so. The McIlroy effect has had an immediate spin off in terms of the pre-tournament Pro-Am with The Golf Channel taking up no fewer than five teams comprised of its executives and leading advertisers. Rory McIlroy tees off on the 11th last year. Pic: Eoin Clarke/www.golffile.ieThat’s partly because they were impressed with the stunning pictures they beamed around the US last year but also because of the huge interest that no exists in McIlroy’s exploits following his eight-shot US Open win earlier this month. The event attracted 82,000 fans last year and the European Tour’s James Finnegan is hopeful that ticket sales will take off over the next four and a half weeks. “Tickets are going fine but because we worked so hard trying to get a new sponsor on board, we are still behind the curve in advance ticket sales compared to last year,” he said. As for the prospect of being left in the lurch by a potential sponsor next year, Failte Ireland chief O’Donoghue confirmed that his organisation would continue to fund the event. “We would be very supportive again next year if we don’t get a commercial sponsor,” he said. “It’s a great product and should be easy-ish to sell, even in these stressful times. If we had had a little more time, we might have even done it this year. Turning to O’Grady, who was seated next to him, he added: “But if that didn’t happen, we would be as supportive again and I believe the European Tour would be. It is a huge fixture in Ireland’s golf calendar and a huge and very important fixture in the European golfing calendar. Failte Ireland depends on the government for its funding and Michael Ring TD, Minister of State at the Department of Transport, Tourism & Sport, made all the right noises with regard to future backing. Speaking at today’s press conference about the government’s committment to golf and tourism, the Minister said: “This sends out a very loud message - Ireland is open for business and I have no doubt that you will get a major sponsor, particularly with the success of our Irish golfers. A cautious George O’Grady insisted in Dubai that he has a plan up his sleeve that could ensure that the survival of the beleaguered Irish Open. 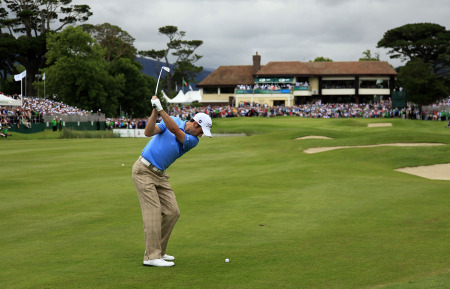 The European Tour is keen to host the Irish Open in Killarney again next season. And Chief Executive George O’Grady confirmed as much yesterday when he unveiled a 2011 schedule featuring a minimum of 50 tournaments in 29 different destinations with the Irish Open pencilled in for July 28-31. The 2011 Irish Open will return to Killarney, where Englishman Ross Fisher held off Padraig Harrington to take the title this year. (©Getty Images)George O’Grady flagged in Dubai last month and last night it was confirmed - the Irish Open will return to the Killeen Course at the Killarney Golf and Fishing Club from July 28-31 next year.